Just like last week we got three newcomers and fourteen attendees. We've been getting quite a few newcomers this week so maybe we'll hit the mythical twenty-one. Mike had mentioned on the facebook group that he'd be coming at 8:30, armed with Quantum. I really wanted to try this game out so I started off with some small filler games so I could pounce on Quantum as soon as it arrived. I started off playing No Thanks! but the deck wasn't shuffled very well so it was easy to get runs. In this game lowest score wins and I won by hardly taking any cards and having a few tokens, resulting in a minus score. 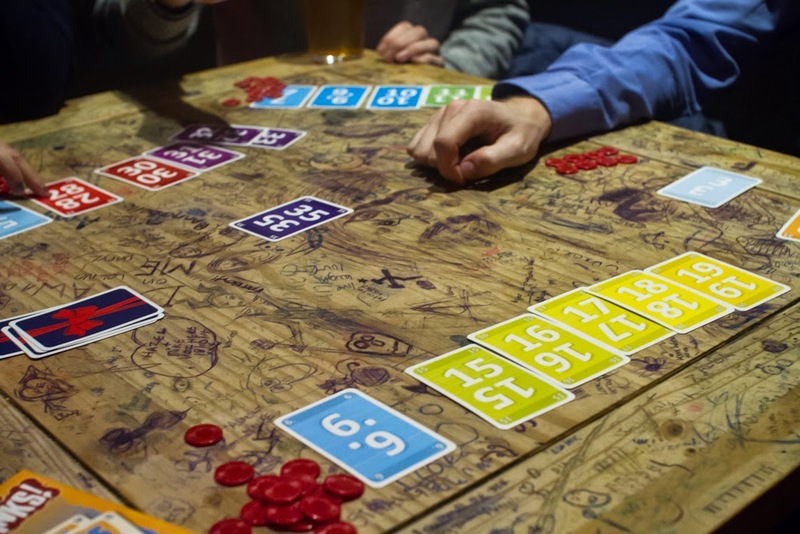 We shuffled the deck (properly this time) and played another game. I managed a double win, getting the lowest score in this game too. Afterwards we played Yardmaster Express with Dan winning. Mike arrived and joined us for another game of Yardmaster with Dan getting a double win himself. 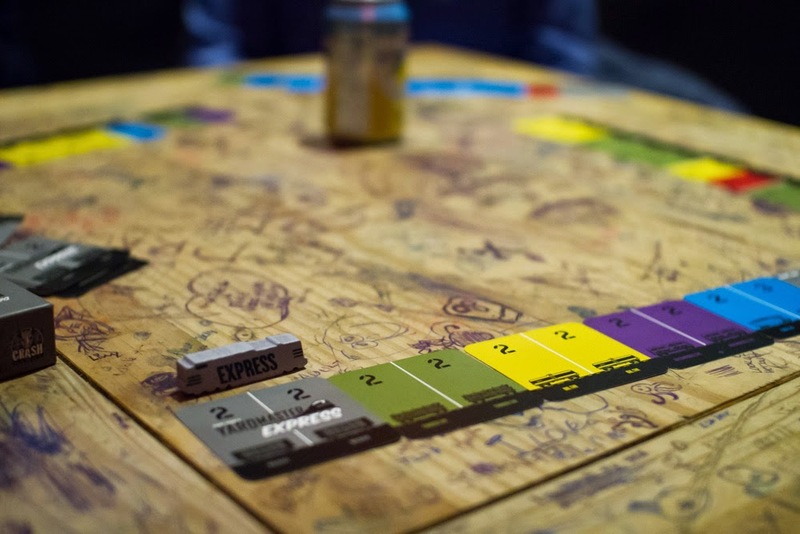 Yardmaster is a pretty cool game but it comes with caboose cards which are shared goals and there are only four of them. The game really needs more caboose cards to add some variation. While we were playing our fillers, Johnny was running Power Grid. I don't think he realised how little of the rules he remembered and had to spend the first half of the game buried in the rule book. Although it took a bit longer than expected, Johnny ended up winning. Alex was running a game of Inkognito. Last week he said it was the game that Cludo should have been but when he described it to me it sounded more like Guess Who. Guess Clue, maybe? Apparently it's good but needs exactly four people and you play in pairs. Alex was paired with Cathy who ended up winning. Mike had arrived and so brought out Quantum. It does a maximum of four people and we had five but it was getting late and Gemma had to get going. That was until Alex came over to pick up Carcassonne and she jumped at the chance to play it. 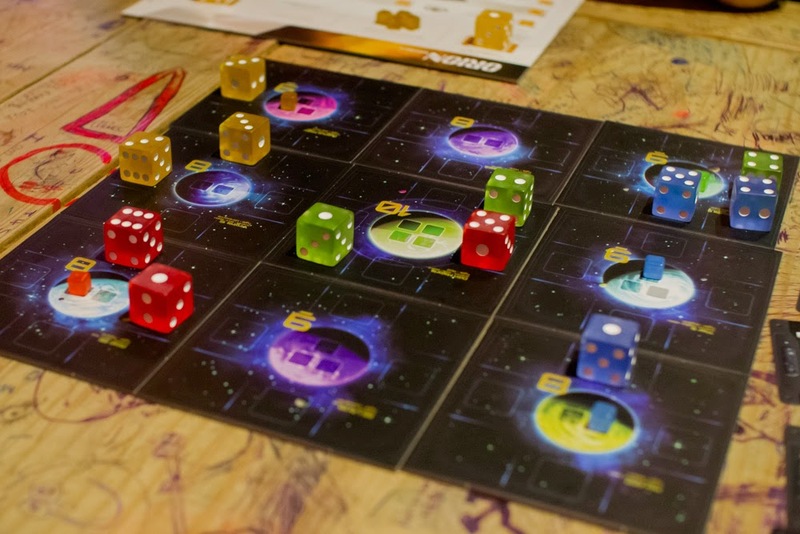 As soon as the Quantum box was opened everyone was far too excited about the dice. They're so big, like King of Tokyo dice, and all translucent. And the game! Well, it's sort of like a 4X game except not really because there's not much exploring. I guess it's more of a 3X game. I really enjoyed it but I could be biased as I won. It was a close game between me and Dan but I managed to place my final cube on what would have probably been the turn before he managed to. It would be a contender for one of the best games of 2014 if it wasn't for the fact that it was released in 2013.